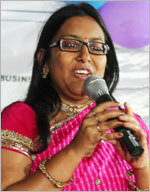 Ms. Sonal Goyal is an academician. She has around 10 years of academic experience. She is a team player with exceptional communication, analytical, relationship management skills. She has done her Masters in Business Administration with specializations in International Business and HRM. Description: Sonal Goyal and Richa Vyas (Nov, 2006). Rural Marketing: An ITC Sagar ChoupalInitiative. Scour Research Journal, Institute of Productivity and Management, Ghaziabad. Description: Sonal Goyal and Richa Vyas (Feb, 2006). Role of Television in increasing insecurity and crime against women. Sovenior of Deptt of Economics, Khandwa, Pg.10. Description: Sonal Goyal (Feb-2006). Economic Development of Backward Area of M.P. with special reference to Jhabua District. Journal of National Research Seminar, Khargone, 4-7. A seminar on Interpersonal communication by Ms. Ratna. Courses It is specially designed, a-market-centric global curriculum. Faculty The faculty at HSB is truly distinctive, global and adopts innovative teaching methods. Guest LecturesHyderabad Scholl of Business Guest Lectures..